Friends and visitors, let's try something a little different today. Heroes: Max Scherzer silenced the Yankee bats and his critics who claimed his inconsistencies suggested he couldn't pitch well under playoff pressure, by throwing 6 shutout innings, carrying a no-hitter through 5. On the offensive side, Miguel Cabrera knocked in the first 3 runs of the game, with a 2-run homer in the top of the first and an RBI single in the sixth. 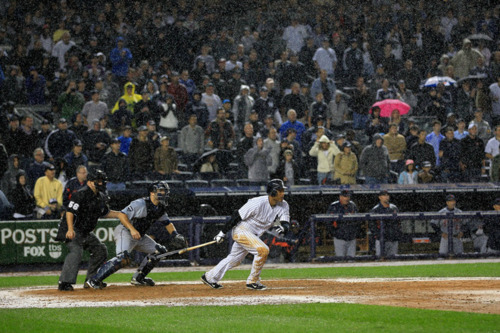 Goat: Derek Jeter went 0-5, leaving 5 runners on base and making a defensive error that lead to the Tigers's 2-run 6th inning. Surprise: Joe Girardi pinch hit for Brett Gardner with Eric Chavez in a situation similar to leading an ill-equipped gladiator out to slaughter in the coliseum.When I saw Chavez digging in, I actually thought, why wouldn't the Yankees pinch hit for him here? Lo and behold, they were using him as a pinch hitter. He looked so over-matched that I thought, at least a strikeout is better than a double play. Chavez had no chance the way Benoit was throwing strikes. 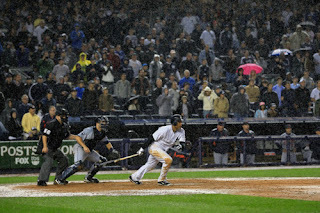 The Yankees made it close in the end, but came up short. power, ... Braun has it all. Hero: Ryan Braun has been playing at an elite level his entire career, but over the last month he has been brilliant. 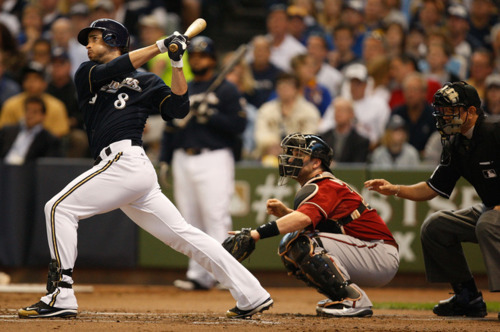 One place scouts and stats can agree is around Ryan Braun hitting superlatives. Goat: Brad Ziegler entered a tie game in the 6th inning, with Jerry Hairston on second base. 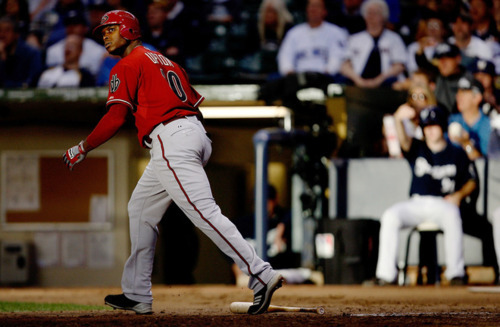 He opened his appearance by balking Jerry Jr over to 3rd, then things got worse, a lot worse: balk, walked Yuni Betancourt, made an error fielding a bunt, intentionally walked Mark Kotsay, single, single, single, taken out of the game without retiring a batter. Surprise: Kirk Gibson left Ziegler out there for so long. by a few bullpen arms. Heroes: The Cardinals bullpen delivered six scoreless innings, allowing only one hit from the fourth inning on. Fernando Salas, Octavio Dotel, Marc Rzepczynski, Mitchell Boggs, Arthur Rhodes, and Jason Motte kept the Cardinals in the game, after their quick 4-0 deficit turned into 4-3, a 4-4 tie, then the Cardinals' eventual 5-4 winning margin. Goat: Tony LaRussa pushed Chris Carpenter to pitch on short rest, something Carp had never done before. It burned their best starter, taxed their bullpen, and may end up as a Pyrrhic victory. Surprises: Cliff Lee seemed to be in his usual control the whole night, but after all, he gave up 5 earned runs and 12 hits. Vance Worley looked like a good piece for October. There are a couple of AL games this evening, should be fun!